If you're a first-time homebuyer, you'd probably appreciate all the help you can get to make the process of getting a Mortgage much easier and less confusing. Based on our experience when we purchased our first home, we were pretty much lost in the whole procedure. There were so many different mortgage options to choose from and it can get rather confusing and intimidating. It is thus advisable for any first-time homebuyer to get professional help to select the best option that suits your needs and requirements. Money Magic is a great site that offers both mortgages and mortgage advice to homeowners and first-time buyers. You can also get a free, no obligation quote from Money Magic. All you have to do is fill out a form with some information on yourself. An Independent Financial Advisor will get in touch with you soon to provide you with a free no obligation quote. Simple and fast mortgages can now be yours minus the hassle of having to search the mortgage market yourself; just leave it to Money Magic to come up with the best options for you! Although I am not in the market for a new home, there is this one particular condominium that makes me yearn for a new home every time I see it and that's Opal Damansara. Whenever we drive pass Opal Damansara on our way out, B and I will automatically steal a glance and sigh wistfully; imagining how cool it would be to live in this fancy Semi-D condominium. The beautiful clean facade of this modern tropical home makes me want to pack our things and move into an Opal immediately. It's not that I don't love our current home; it's just that Opal is truly breathtaking! Furthermore, it is situated right behind our current residence; making it impossible to ignore every time we drive out. 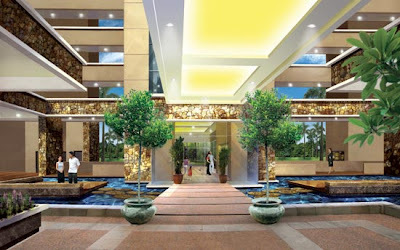 Set amidst a lush tropical paradise, everything about Opal spells luxury and style. Every unit of this condo is designed with a view; either the swimming pool, green lung, botanic garden or the golf course view. I can already picture myself having my morning coffee out at the balcony, taking in the beautiful scenery of this area. I love this lobby picture of Opal; it looks very well maintained and inviting. And wait till you see what awaits you inside. If I had such a cosy spacious place as this, I'd definitely wouldn't want to leave home! Our first home after B and I got hitched was a really tiny condo in Sri Damansara. The kitchen was so tiny that if both of us were in there at the same time, it would be too close for comfort. When we moved into our current home, which is much bigger than the old one, we actually needed some time getting used to our bigger living space. Space is thus very important for us when it comes to home and Opal offers exactly that! The main reason we fancy owning an Opal is its location, which is deemed as one of the most affluent neighbourhoods in PJ. There are many wonderful conveniences and amenities here including I Utama, IKEA, Ikano Power Centre, The Curve, Cathay Cineleisure and Tesco. Opal is also located very near to B's office, so there is more than one reason why we are very interested in this modern tropical home. If we ever decide to get a new home in the future, Opal Damansara or its equivalent will definitely be on our list. For now, it will remain as a distant dream; one that will continue to inspire us to save towards a bigger, better home one day! Have a good week to all my readers. Wow GK, it's been a while since you've been my first commenter YAY! eh GP... must be expensive kan Opal tu.. what's the rate going now for Condo in PJ?? It looks really high class... I like!!! Oh sorry LJ, they do have some duplex units!! I bet that one would be even more superb wow! But for me doesn't matter.. 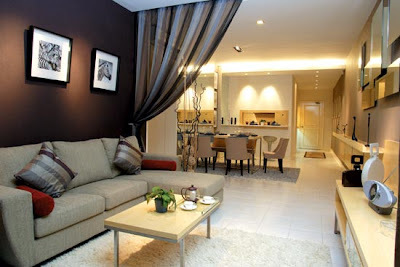 I've lived in apts all my life while in Singapore.. so I'm easy..
Of coz the bigger units are more expensive. I think B would prefer a house, but right now we're quite content with our condo lifestyle. Our dream condo would be a duplex with a garden and in our current area! OMG, I hate this Brooke la! Bridget is just bein silly, she shld really move on and stop trying to win Nick back. And what's up with Nick? Baru separate from Taylor and instead of running to Brooke, ended up in her daughter's arms! Angry or not?? I hope Ridge will dump Brooke then padan muka cause she'll have nobody left! Yeah lah woman.. I hope Ridge does dump Brooke.. and what's up with Taylor and Rick? Can you imagine if they get together..lolzz.. Brooke with be Taylor's MIL! Lolzz..that would be crazy..at least Taylor still has some sanity left while Rick is totally in lust!.. and menyampah I tengok si Donna tu..pushing herself like that to Eric..macam tak laku sgt kan?? heheh.. yelah must really rope hubby to watch more episodes with me... cant wait to dl today's episode! As for Donna, I lagi menyampah with Eric!! Although Steph had it coming, she doesn't deserve the disrespect Donna and Eric are showin her now! OMG! If taylor marries rick..i think i would faint..lolzzz...hehehe.. i am beginning to respect only Stephanie..and that is scary....lolzzz!! Ha ha ha actually, I've been filling him on Boldie ever since we got married, poor thing! So he pretty much knows the plot and nowadays whenever Brooke does something so infuriating and I'd get this angry look on my face, when I turn to him, he also has the same angry look, ha ha ha!! I just love discussing boldie with you GP!! muahsss!!! Nite2 GP... nite nite GK!! A seni-D condo? First time I ever heard of one, but then I'm your regular blogsphere doofus, ya? LOL! I'm just hoping that one day by some miracle that stalled condo project of mine eventually starts up again! And I see GK is trying his best to get top commenter here by leaving 2 comments, that dirty little cheat ... LOL! Opal, my birthstone! I love the name and by looking at the pictures, I must say that the place looks great! Hurry go and book one for you & B! Will tell Elina to buy one too! Wow this is beautiful and magnificent!!! We shall hope and pray that u will get to stay in this place someday. If we were to stay in this place, we would never wanna go anywhere else! Hehehe. I enjoy reading your blog. I always thought dating sites were for people who were loosers.. so i never went on them.. after college it was real hard for me to find someone. with work i got so busy and i stop going to clubs and bars, just not the right atmosphere for me anymore... so a friend of mine told me about http://www.perfectma8.com , she told me its free and thats where she met her fiance.. so i sign up and in two months its our first year anniversary... i am a true atory dating sites work.. but i also have to say, from other peoples experience not all of them are the same.. so make sure you check them out... good luck. 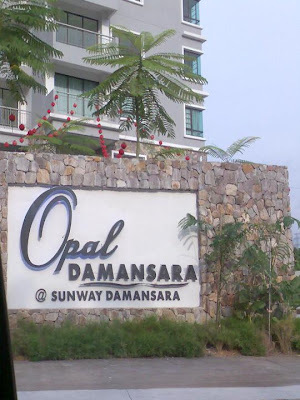 GP, yes this Opal Damansara looks very outstanding and gorgeous! the lobby is like a hotel lobby. How much is this unit? 7 digit? it looks very spacious too, and the location is totally prime and great too. GP!! I've got a million bucks and am seriously considring an alliance! Should we go for it? ooh wow... the placeis incredible. I love the interior!!! =) have a great weekend! eh the living room tu ingatkan bilik the wizard!